​Call it mid-life crisis, I suppose. As I write this, I’m in the middle of a forcible removal of myself from, well, everything, going on at the moment, which has given me a little time to think about where I am, where I’ve been and where I’m going next. And seeing that this is what I project to be the first in a series of, ‘scribbles’ for anybody who might be interested in my work, or might be into (or planning to get into) art as a career (or as something to do because bungee-jumping wasn’t exactly their thing), well, I thought I might do a little ‘scribbling out loud’ on the subject. I mean about why anybody might choose to do what a lot of people consider quite useless or impractical or just plain weird. Why anybody might choose to do something that doesn’t always lead to fame or fortune (although when it does, boy does it ever) and has most everyone you know looking at you funny because you don’t go to work in a high-rise in a suit. Nobody likes to be looked at funny (well, generally, anyway), and I reckon everybody likes to be, well, accepted and to have people have a good opinion of them. 'Oh, he’s got a good job' or 'Oh, he’s vice president now' or 'Oh, she’s got a lovely three-year-old.' People who do what I do don’t always get that. Which would actually begin with the fact that I never really wanted to do this as a career, really, to begin with. I mean, when I was a kid and they asked you 'What do you want to be when you grow up?' I never said 'a painter'. I remember saying 'architect' (or 'carpenter', even). As a high school senior, I remember wanting to be a copywriter, like in an ad agency. Seriously. I have this vague memory of some chick who used to work at an agency describing what it was like to write commercials or something (I have this even vaguer memory of it being for shampoo), and I remember thinking to myself, hey, I’d like to do that. But even I had the idea at that age of not being able to make a decent living if I had painting for a job. Yet, I spent the first couple years or so making jokes to the effect that I was actually enrolled over at the uni where the art was, and spending my time taking figure-drawing classes at the gallery I’d been taking lessons at the time, and unsuccessfully (and quite naively) joining student art competitions. 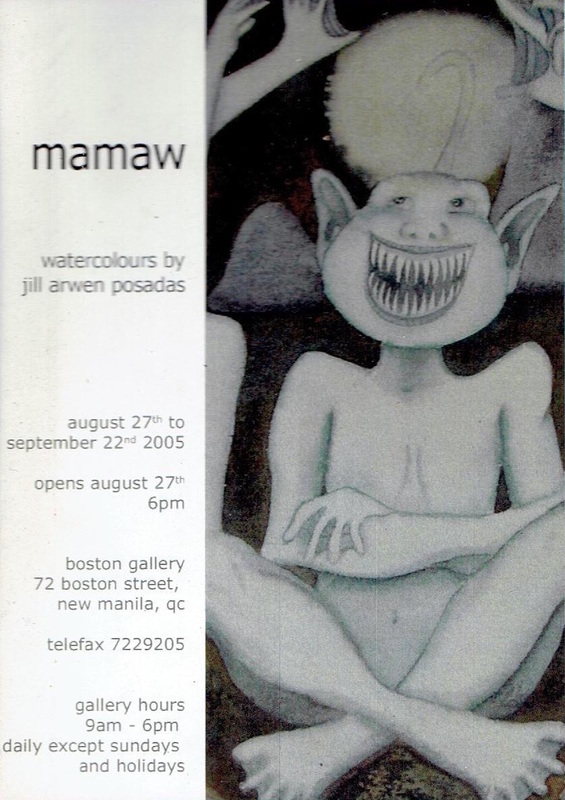 Even when I already was working at an ad agency as a copywriter, all my money was going to paint and to art classes (and the gas to get there). I really can’t seem to pinpoint when I decided I wanted to DO this. Maybe it was around then. I just couldn’t help myself. And I knew I wanted to go back and get my art degree (as in ‘fine’, not ‘communication’, lol). And I did. I knew that if I did that, I would lose the relatively okay copywriter’s paycheque I had, and that it might be difficult to go back to agency work once I’d left. (I’d always had a sixth sense that way.) But I did it anyway. I remember asking my creative director whether he’d allow me to go to school and work at the same time (because I knew this other chick who was doing market research or some such was doing just that), but he said no. But I was happy to take the plunge. I admit things went to shite right after I made that decision—money was tight at home and even if I had been working a regular job up until then it’s not like I was helping out, but Mom and Dad let me carry on, anyway (thank you, Mom and Dad). I remember at one point I was working six jobs (including the radio station) on top of school, but it all worked out somehow. And I was happy, more or less. (More like less? Lol) The upshot of it being I was doing what I wanted to do. Which was to paint things. Make my own pictures. Learning (or trying to learn) how to make them better. More believable. I wanted to make my monsters come alive—I figured, the more ‘real’ I could make them the more I could get people to believe they were real—or something like that, anyway. I don’t know if I’ve succeeded since then, lol. When, as I’d predicted, I had a hard time getting back into the workforce after I got out of art school, it was the art that kept me going. One thing led to another and I finally got my first show at the tender age of 30, LOL. I remember at least one person thinking I was ‘very brave’ (i.e. you’ve got some nerve showing junk like that in public), but even now I knew I wasn’t quite ready at the time. Even now I don’t know that I am. I mean I’m not, ‘happy’, but I’m even more ‘not happy’ when I’m not making anything. I really don’t know why that is. And yet this year, the year I finally took that supposed year-long break -away- from making things, here’s me about to attempt to crank out a few more canvases in time for December. I’m as tired as I’ve ever been, but at least that, gnawing (for lack of a better word at present) I have in the back of wherever has quietened down, somewhat. Deep, deep down I guess I knew this would happen, which was why I kept putting off this 'year off' for a couple or so years (I’m not quite sure when I started to want to take it). But now that I -have- actually tried to take a year off to just recuperate, I know now that for people like me, perhaps, it’s just not possible. I guess you could say it’s like being a mermaid, or a centaur. Running around like a horse is making the centaur as tired AF, so he thinks he’ll take a break for a while and -not run-, and spend the break focusing on his man-part, instead. But see, he really is half-horse by nature, and before the year is up, even though he hasn’t quite recovered from more than 10 years of living both as a horse AND a man, he’s ‘back in the saddle’ again. He can’t help it. It’s his nature. He’s really built that way. You can’t separate the man and the horse, and if you did he would probably die—like chopping conjoined twins apart when they’re sharing major organs. He can’t stop running around, it’s what he is. He just HAS to do it. So I guess that would be like, the reason (or ‘a’ reason or at least MY reason) for choosing, of your own free will, to put up with 'Oh why don’t you get a ‘real’ job'' or 'What’s the point? You’re not making money doing that' and so on and so forth. Choosing to burn the candle at both ends because art demands a 100% commitment the same as any day job, whether you work from home or not. Choosing to sacrifice your time, your well-being, your resources and possibly any relationships you might have to Daemon and to your Muse, allowing them to drive you like a whipped nag on her last legs. Sure, you’ll probably sleep more and you’ll have more money (because you didn’t spend it on framing or new knives), but I think what you end up doing with all that extra energy and resources is to just keep on running from who (or what) you really are. And doesn’t running make you tired, anyway? And while you’re running, you have all these new images, these new monsters—popping up in your head and since my own head is not very big (my brains, I mean, anyway, lol), it soon becomes crowded and the monsters start scratching at the walls or trying to bust holes into them, clamouring to be let OUT. Geez, what a racket, lol. You know, it’s like I always say—​there’s no such thing as a perfect job. Or career. Or calling or whatever you want to call it. Like this lady said on this self-help show I used to watch, every job has a sh-t sandwich—but if you love what you’re doing THAT much, you won’t mind eating it. If you do, then it might be time to find a new job. Or Something to do. I forget right now who said this (I’m pretty sure I heard it during one of those Van Gogh films) that you need to give your whole heart and soul to art, if you’re going to do it. I know I heard in this anime movie I must’ve seen a gazillion times that you shouldn’t get into the martial arts unless you’re willing to go all the way. Martial arts = still art. I’m not sure feelings are enough? Because feelings change. I don’t know what it is, but I do know it must be more than that. But whatever it is, it’s THAT that will drive you to choose this less-travelled path, and make it possible for you to continue on it, although, more and more people do seem to be following it these days, and I say, good for them! If you’re one of them, to you, I say, good luck, Godspeed, and however hard things get (because they will get hard), keep going. And if you can’t, ask yourself why you’re on this path in the first place. And if you need help figuring that out, for what it’s worth, I’m here.